Visit the Seafood Department in your local Market Basket to shop a wide variety of fresh, quality seafood. 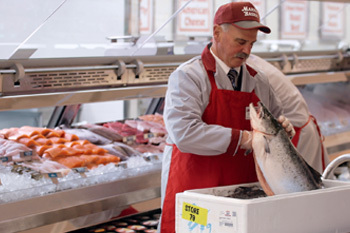 We offer an array of whole fish, fillets, and steaks, both wild and farm-raised. We work with a network of fishermen locally and around the world, delivering fresh seafood daily to every store. Before any seafood arrives at our stores, it goes through a rigorous inspection process. This guarantees that our customers enjoy the highest quality seafood at “More For Your Dollar” prices. 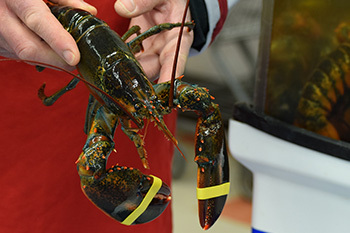 The Market Basket Seafood Department extends well beyond fresh fish. 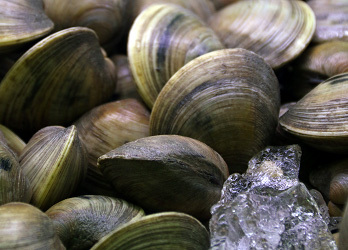 We offer a wide variety of shellfish, including lobsters, crabs, scallops, steamers, clams, oysters, mussels, and shrimp. We also have the finest selection of frozen fish and seafood products that add convenience to your meal preparation, such as crab cakes, stuffed clams, fish tofu, salmon burgers, and breaded haddock. The Market Basket lobsters are harvested from the local cold Atlantic waters. The tank is always full of variously sized lobsters, both hard shell and soft shell, to satisfy your needs. We will steam your lobsters at no extra charge! Come check out our "Live and Kicking" lobster tank in your nearest Market Basket store. Don't miss the variety of local fish offered in our stores, most of which is caught right here off the coast of New England.